Teacher Gifts for Wonderful Wednesdays | Who Are You Calling Crafty? Well I have been working on Teacher Gifts for Wonderful Wednesday. This morning I was going to make bracelets then I decided to make bookmarks instead. The beaded ribbon bookmarks are pretty popular I have seen them in gift shops, book stores, Etsy, pretty much anywhere that you can think of. One thing that I don’t have in my stash of crafting supplies is a vast array of ribbon. Unlike my grandmother’s basement that has every shade and size imaginable, it is truly a bummer that I live so far away. Going into my grandmother’s basement is like a trip to the craft store and thrift shop at the same time. Anyways back to my story – the only ribbon size I had was 1/2″ ribbon in pale yellow and pale green. Which worked rather nicely because I wanted it thicker and tied so you could just slip the pages through the hole, so you never lose your spot. I will say I wanted many pretty beads hanging off the end it didn’t happen. Here is why, unless you have very big holed beads don’t plan on threading them through the thick ribbon (trust me it was very frustrating). My grand plan of having several beads hanging off the end was quickly changed to having one hanging off and the ends tied. It was a very easy project and I think my daughter’s teachers will really appreciate the ribbon – beaded bookmarks. Glue (to spread on the edge of the ribbon to prevent fraying. Cut ribbon. Add charm in the middle, tie off. Go down 1 1/2″ (might want to add beads here) tie another know. 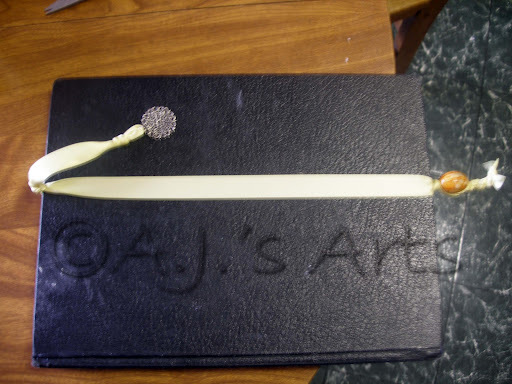 Take book and open the front cover, slide ribbon around the front cover, tie off. Add beads to the bottom of the bookmark. Congratulations you are finished and now have a wonderful bookmark for a teacher, mom, friend, or yourself! I added mine to the flowers I made a simple Wonderful Wednesday Gift for my daughter’s teachers. The flower with the bookmark tied around it. 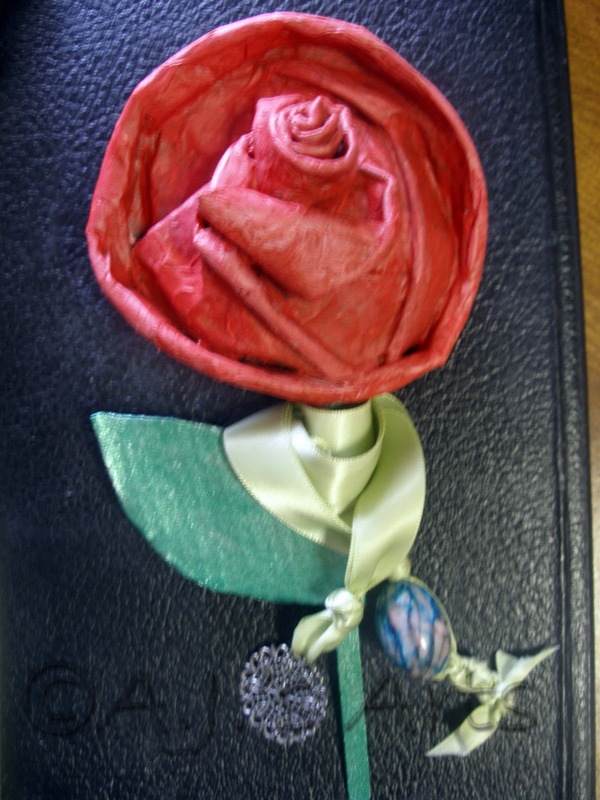 I have to put a little note explaining the bookmark – I might throw something in explaining the Eco-friendly flower.